The What: Broadcast Pix introduced RCC, its new IP camera control panel, at the 2019 NAB Show in booth SL4210. With its software-defined open architecture, RCC can be customized to control different types of cameras and support gear—including PTZ and broadcast cameras and robotic heads—and mix IP protocols within the same production. The What Else: The compact RCC has a durable, machined aluminum chassis. Its three-axis joystick with adjustable zoom speed and one-touch auto focus allows smooth, precise control for shots. The RCC also adjusts focus, iris, white balance, and more. An integrated 7-inch touchscreen provides intuitive menu navigation to cameras, shot presets, camera settings, and system setup. Users can also customize the number of cameras and camera presets as needed, as well as camera and preset shot names for easy recall. 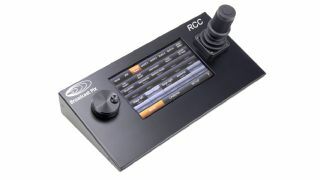 The Bottom Line: Designed for remote productions, RCC can be used as a dedicated camera controller with any BPswitch integrated production switcher, Broadcast Pix Commander touchscreen control platform, or production switcher from another manufacturer. RCC features a high-quality precision encoder, and includes native IP support for Panasonic and Sony PTZ cameras. Support for other cameras and robotic heads is available as a separate software option. RCC will be available in Q3 2019.